I committed my life to Christ in 1995 while watching Charles Stanley preach on TV one Sunday morning. I was as sincere as I could be. I wanted to know Jesus. Shortly after that, the Lord opened a door of opportunity for me to serve in an administrative position at a church. Even though it was less money, I considered it a step up and indeed it was! Thus began this crazy journey with Jesus of the last 23 years. In 2001 I stepped out in faith and left my church position to spend time in England at a church on the cutting edge of ministry. I went to learn how to do ministry in a more impactful way. It turned out to the best year of my life and the worst year of my life. It was the worst year of my life because the Lord led me into a “dark night of the soul”. After experiencing such a joyful time in my faith journey in the beginning…I could no longer sense that God was with me at all. It was a painful time of stripping away all that I relied on instead of Him for a sense of self-worth. It was a time of testing and it revealed what was really in me. It was dark and terrible. It was the best year of my life because it changed me from the inside out and it was a complete work of grace. I could not do anything to help myself…the Lord had hemmed me in…on all sides. I was powerless to move. I could only sit and contemplate. I wasn’t given a choice. No work. No ministry. No way to prove myself worthy to anyone in any way. I was learning to “be” rather than “do”. It’s counter cultural, it’s humbling. It’s like dying. I became acutely aware of my brokenness before God…and the fragility of my corrupt and wounded soul. Up to that point, my relationship with God was all about what I could do FOR Him. That began to change. I would never approach the work of ministry in the same way again. In 2003 I moved to California to attend Fuller Seminary. On the tail end of my dark night of the soul, I was still a bit raw. I had been broken to pieces by God and was slowly being reconstructed. I read countless books and attended countless lectures…but it was one single class on leadership that put everything regarding the dark night of the soul into perspective for me. The class was not about leadership strategies…the “doing” part. It was about how the Lord breaks a leader and teaches them about the true source of power for ministry…learning to “be”. It was about forming the spirit of a person. It was about how ministry flows out of being. “Being” has to come before “doing”. Everything in our culture says just the opposite. The world keeps us busy, preoccupied, distracted and the noise level is always high. It’s in learning simply to “be” that we get to KNOW God. Most people seem to be content only knowing ABOUT God…perhaps because they’re not aware there is more. I came out of the dark night of the soul wanting to KNOW God…not just know about Him. I sensed the Lord challenging me to push into the mystery more. After seminary I went back into church ministry. Eighteen months later, I resigned. Something was missing. There had to be more! I took a job at a retreat center in a forest on the beach of South Carolina. My objective…to seek God simply for who He is and not what He could do for me. I wanted to know Him. I thought a quiet place in nature would help. For the most part, I stopped praying with words and spent time simply learning to sit in the presence of God and enjoy Him. This didn’t come easy…it wasn’t natural. It took some effort. But it did not disappoint. It changed my relationship with God forever and changed the trajectory of my life. It’s still not easy but when I sit in complete silence and think about God…His presence lights me up on the inside. It’s sweet. It’s love. It’s why Jesus came and died for me…that I might KNOW God and enjoy Him. It puts the world in its proper perspective. In the coming months, this blog will shift focus from Uganda to knowing God through contemplative prayer. I am feeling compelled to share and write about this. I don’t have all the answers. I’m just a beginner myself. I suspect many Christians wonder if their current experience of God is all there is and how very few people have any sense of the presence of God with them at any given time. Yet we know that those who believe have the Spirit of God abiding on the inside of them. Why do so many still feel that God is out there somewhere, far from them? Why do they see so little transformation in their inner lives? We don’t know how to “be” with God. Being with God changes us. And changed people…people who know how to “be” first, become significant “doers” for the Kingdom of God. We live in a crazy world and it’s getting crazier by the day. The evil one has perfected the art of distracting our attention away from God. The ways are too numerous to count. Yet, rest assured…God is near…closer than your breadth. Let’s learn to “be” with Him. There is more! After being home for a year, I’m returning to Uganda in October and I couldn’t be more excited! I’ll be leading a team from St. John’s Parish from Oct 16-25. I’m very much looking forward to seeing my Ugandan friends again! to put a permanent roof on a third church structure in the Maaji Refugee Settlement whose grass thatched roof was leaking and falling apart. The people were so thankful to God for providing these things for them. It encouraged them that the Lord does see them and care about their suffering. In the photos below you can see all three of the churches. Dr. Katie has used these structures to also do medical missions and teach classes. The large photo is of Dr. Katie at the celebration and dedication of the new roof on the church at Maaji. Site 1 – We have a church! Thank you so much for supporting these fellow Christians…giving them places where they can gather to worship out of the rain and the hot African sun. May the Lord bless you abundantly for your generosity and love. I’m sitting in an air-conditioned house on a comfortable sofa in front of a big screen TV…I just had a hot shower…and I used tap water to brush my teeth. I’m realizing that although I like these things very much…they weren’t all that hard to do without. I’m thinking about what my next apartment might look like when the time comes…and I’m pretty sure it will be under 700 sq ft. Everything I own is currently in a 5×10 storage unit and that’s the way I would like to live…owning no more than would fit in such a space. I get overwhelmed in the grocery store…so many choices…yet I often walk out of the store with only one or two things. I wonder if, over time, I will re-assimilate to the material culture of the US…or if my changing worldview is something permanent. The pull is strong…to just go back to my life as it was before Uganda. I wonder what the Lord is doing…how He will use me here considering all I have learned and experienced in the last three years. God’s timing seems strange sometimes and I’ve learned to slow down and take it in and be intentional about trying to see Him weaving circumstances together. A meeting with the Bishop here to discuss my return has been postponed after shocking news last week. The Diocese of SC has just learned that it lost a court case with The Episcopal Church and will have to turn over all its buildings and property, should a re-hearing of the case be denied or lost…a very real possibility. There continues to be growing divisions in the US…tribalism and racism are alive and well in our western culture. Political turmoil and international threats abound. There is a shaking going on…in the Church and in the world. I wait patiently for the Lord to reveal my next assignment. As I wonder and wait and watch, I am at peace. I spent my first two weeks back in the US recovering from a nasty case of bronchitis…no doubt picked up on the 20+ hours spent breathing re-cycled air on a plane. After that I visited my parents and brothers in MS. It was good to see family. I’m back in Charleston now, living with a friend in Hanahan who has generously opened her home to me for as long as need be and has provided transportation as well. Thanks be to God for Jennifer Miller. As I wait, I have been put on the preaching schedule and asked to teach a class at my home church, Saint James. I still continue to be involved in the life of Janani Luwum Theological College. Just today I was emailed the final exams to be graded of the class I taught just before leaving. I also continue to input financial records into Quickbooks monthly. It’s been good to see friends and smell the salt air and be in a place where driving laws are adhered to…at least for the most part. The primary reason for this update is to report on the use of the funds raised for Sudanese refugees in Northern Uganda. 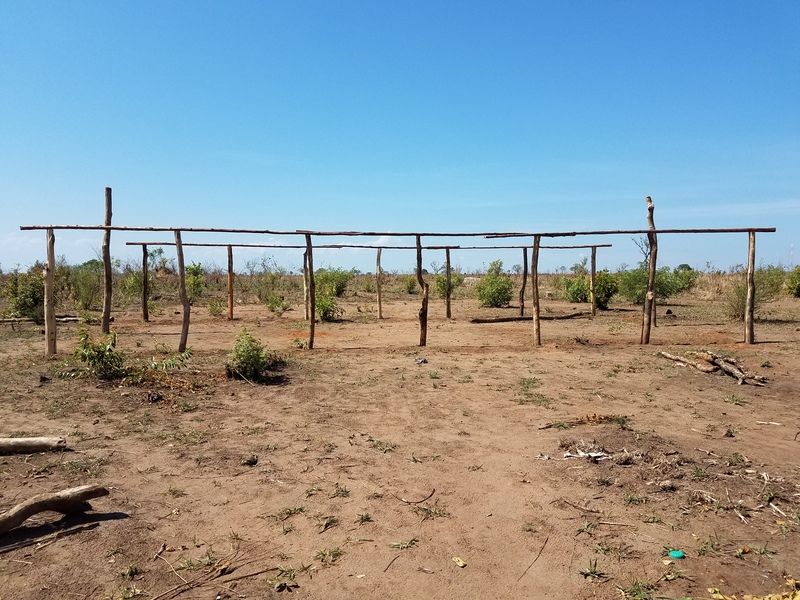 After my visit to a refugee camp in March and blog post regarding the needs there, over $5000 was raised to help build two basic shelters to be used as church structures for Christians in one particular refugee camp. This was more than enough to cover this expense. Dr. Katie Rhoads has reported that with the funds, she was also able to have altar tables and benches built for each church. She purchased fabric for the women’s ministry to sew uniforms for themselves and the lay leaders. She has asked permission to purchase two sewing machines for the women there and also to build another church structure in a different camp. I have given the green light, knowing the donors of the money would be happy to know their generosity is enabling further blessings for these suffering brothers and sisters in Christ. Dr. Katie also used the sound equipment and projector/screen I left behind to take the Jesus Film to the refugees…something I pray will continue. I can’t think of a better use for the equipment than to encourage the refugees. Dr. Katie also used the completed shelters to host a medical outreach back in July. The buildings are multi-purpose. In the top photos above you see can see one structure before the mud walls and then after the mud walls have bee completed. The photo on the bottom right is the other structure as the doors were being installed. It too will have mud walls. Above are photos from the medical outreach Dr. Katie did in July, using the church shelters as a meeting place. It’s great to have these shelters be available for other needs as well. I’m sure Dr. Katie will continue to use them as such in the months to come. I was so excited to see the Jesus Film taken to the refugees. I prayed often that the Lord would raise up someone to carry this ministry on after I left. You can see in the photo on the left, a group of students from Janani Luwum Theological College setting up the projector and equipment. Killing two birds with one stone…practical ministry experience for the students and encouragement for the refugees! Please continue your prayers for these people. Click here for a recent article concerning refugees in Uganda http://www.itv.com/news/2017-08-04/south-sudan-civil-war-number-of-refugees-fleeing-to-uganda-close-to-1-million/ If any churches in the Charleston area are interested in how to support the raising up and training of indigenous leaders in Northern Uganda or supporting the work of Dr. Katie Rhoads to Sudanese refugees, please contact me. I would LOVE to talk with you about creating partnerships to aid in these incredibly important and worthwhile ministries. I welcome your prayers as I continue to transition back to this culture and wait for the Lord’s next assignment for me. 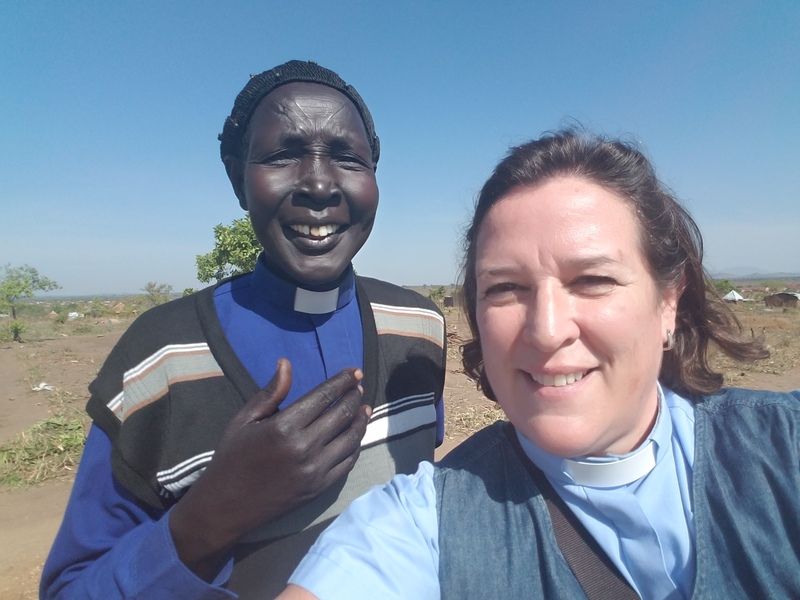 I have often shared in these blog posts over the years how challenging it has been to adequately articulate my experience of living and ministering in Uganda. I never imagined the extent to which the power of culture impacts our collective and individual identity…nor how much it confounds communication. I had read about these things before coming to Africa, even studied it…but nothing could have prepared me for living the experience. Like a fish out of water, you can have no idea what exists outside your home environment or realistically imagine how worldviews impact values, hopes, dreams, choices, fears, etc without firsthand experience. There is no substitute for living in a different culture for an extended period of time and having your comfortable worldview turned upside down. My inability to effectively communicate the experience has, in some ways, led to a sense of aloneness. My expanded worldview has made me sad for humanity in a way I have not felt before…but it has also brought joy through a whole new perspective on the Gospel of Jesus Christ…one which is much deeper and richer and meaningful. One which has humbled me and given me a greater appreciation for the grace and mercy bestowed upon us that we so easily take for granted. If it weren’t for the Good News…I would have no hope at all. I felt and believed this before coming to Uganda…but now it is seared into me in a wholly different way. My hope is more fully grounded in the work of Christ to redeem the world. He is the only One who can unite us. The Church is the only place on earth where different cultures can come together and be fully unified in identity through faith in Christ. I am grateful to everyone here in Gulu who has made the last three years such an amazing time of learning, growing and ministering. I’m especially grateful to Bishop Johnson Gakumba, for believing in me and ordaining me to the priesthood. I’m grateful to the entire staff of the Diocese of Northern Uganda for your friendship and for welcoming me with open arms and showing me your amazing Acholi hospitality. To Rev. Godfrey Loum and the wonderful people of Christ Church Gulu who received me and allowed me to be a part of your church family…I have loved worshiping with you and serving you the last 2 years. I owe a huge debt of gratitude to Rev. Sandra Earixson and Dr. Katie Rhoads, fellow American missionaries who have both been in Uganda for more than 12 years and have been my mentors and helped me navigate the culture, prayed with me and encouraged me when the challenges felt overwhelming. There are so many others but to name them all would make this blog post way too long! It has been an honor and a privilege to share in ministry with you all. I am grateful to Saint James Church, my sending agency and home church, for supporting me in every possible way and enabling me to be here. I am especially grateful to Rev. Arthur Jenkins and Rev. Louise Weld for their unwavering support and to the Saint James Missions Committee for always praying for me, encouraging me and making sure I had everything I needed during my time in Uganda. Berta Puckhaber, the bookkeeper at Saint James, has worked tirelessly with me to receive contributions and manage funds…thanks Berta! I am grateful to St. John’s Parish, Holy Cross, St. Andrews, Church of the Resurrection Surfside, for their support and prayers and encouragement over the last three years. To all the many friends and family who have supported me financially, prayed for me, lent me transportation and provided a bed to sleep in on my visits stateside…you are the hands and feet and heart of Christ to me. All of you made the last three years possible! Once again…I am without adequate words. May the Lord bless you all abundantly for your love and support and sacrifice. Finally, I give thanks to the Lord, who has never failed me, always provided for me and protected me and who continues to change me from the inside out with great patience and grace. O, what love!! You have taught me so much here…it has been a privilege to be a part of your Kingdom work in Uganda. My three-year Uganda work visa expires the first week of July so I will depart for the US on June 28th. I’ll take a little time to rest and assimilate back into American culture as I discern what is next and wait for the Lord to open the right door to the next ministry assignment. I invite your prayers for that process and for my remaining time here in Gulu. 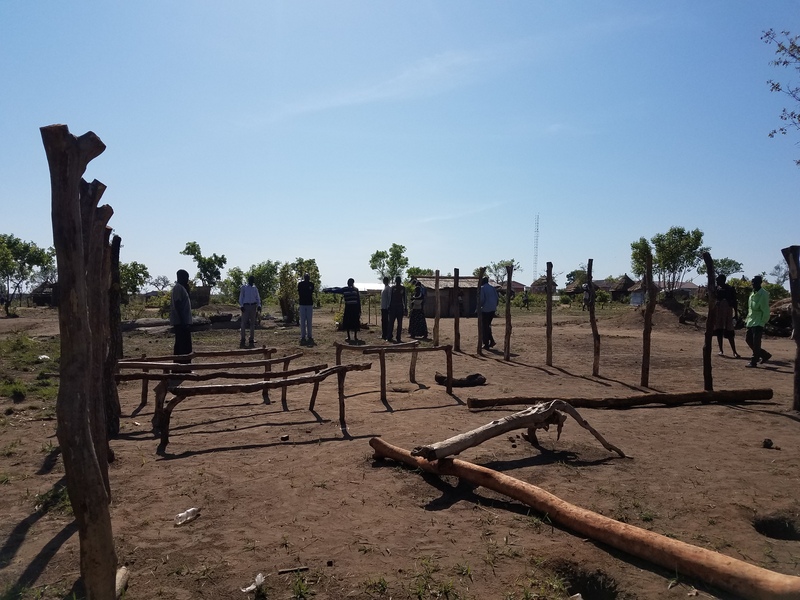 My most recent blog showed the materials being delivered for the construction of two simple shelters under which the Sudanese refugees could gather together to worship and be encouraged…below are the two structures so far. Above is the structure at the first site. As you can see, it’s a nice building with iron sheets instead of grass thatched roof. They are using tarps for walls, which works really well. They are so happy! Above is Site #2. As you can see, they have yet to put on the tarps for the walls. It’s still a work in progress. We have also distributed audio Bibles as well. We have raised $4,700 so far! Thank you to those of you who so generously contributed to this project. I will post again with more updates later. 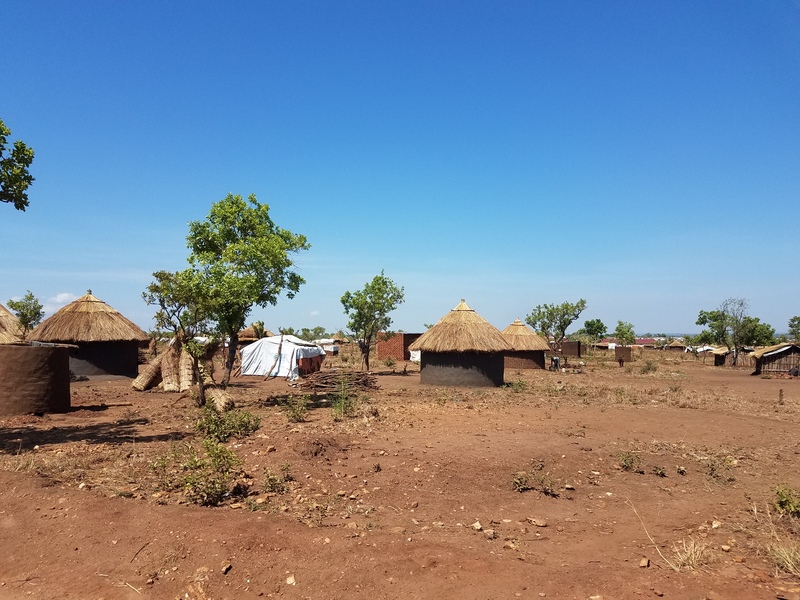 My last blog post…God, Send Someone…shared about the plight of a group of Anglican Christians in a Sudanese refugee camp in Northern Uganda. Thanks to some very generous folks with big hearts and a love of God’s people…we have raised $3,300 so far to build worship shelters so that the people have a place to gather and pray together in the camp. I am thrilled to announce that we have delivered the first truckload of building materials and the work has begun. See the photos and videos below. It’s not too late for you or your parish to participate in helping our brothers and sisters in Christ fleeing war-torn South Sudan. Please refer to my former blog for information on giving. We will also use the funds to buy and distribute bibles to the people. I plan to visit the camp again in the next couple of weeks to see the progress. I’ll report again after that. For now, I just want those who have contributed to know how much I and these people appreciate you and thank God for you!!! We raised enough money to purchase iron sheets for the roofing instead of having grass thatched roof. This roof will last a lot longer. We delivered bamboo poles and timbers, nails and iron sheets. 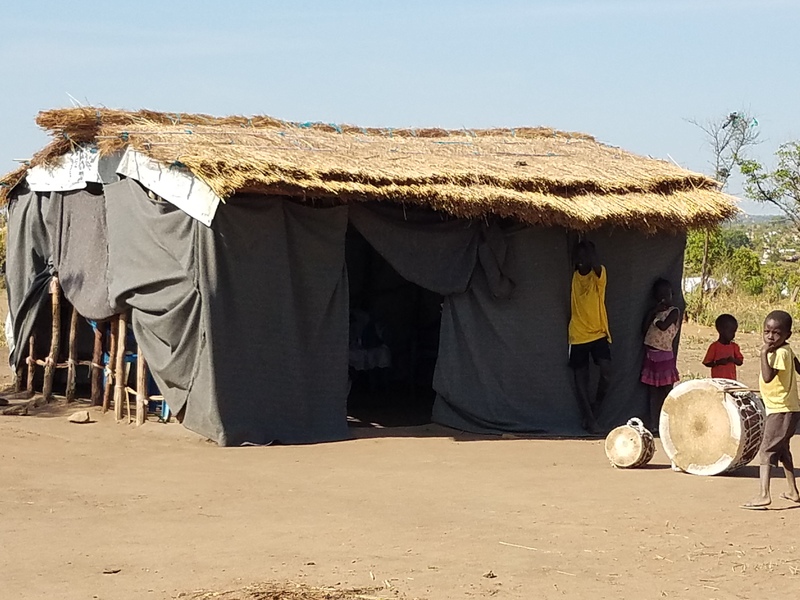 As we drove into the refugee settlement, I saw scattered mud huts and makeshift latrines and attempts to establish some modicum of a normal life. But their lives are anything but normal. It’s very hot and this area has few trees to provide shade. We were welcomed by singing and ushered into a small hut with a tarp from the UN for a roof. 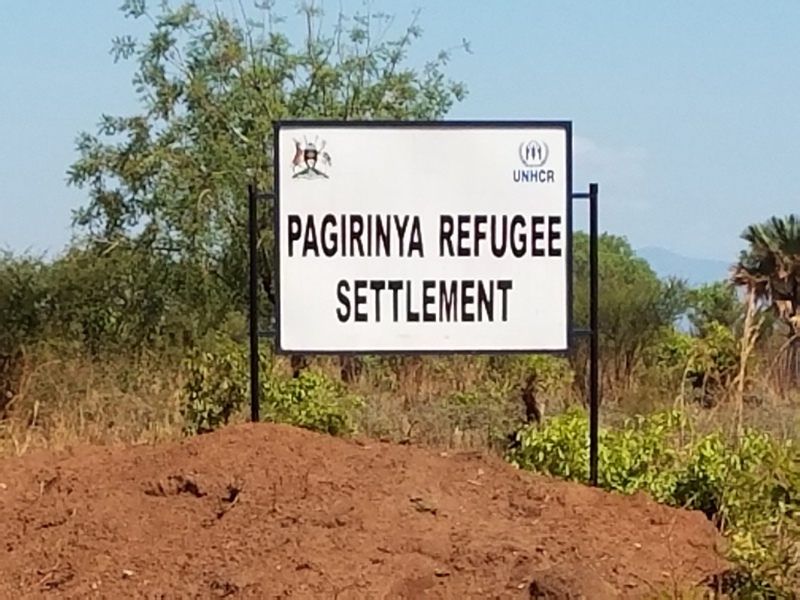 There were 10 representatives from the two Anglican communities within the Pagirinya Refugee Settlement, located about 20km from the border with South Sudan. This particular settlement is quite large and has 41,000 people. However, all together, there are about 250,000 Sudanese refugees in 12 different settlements in Northern Uganda near Adjumani. 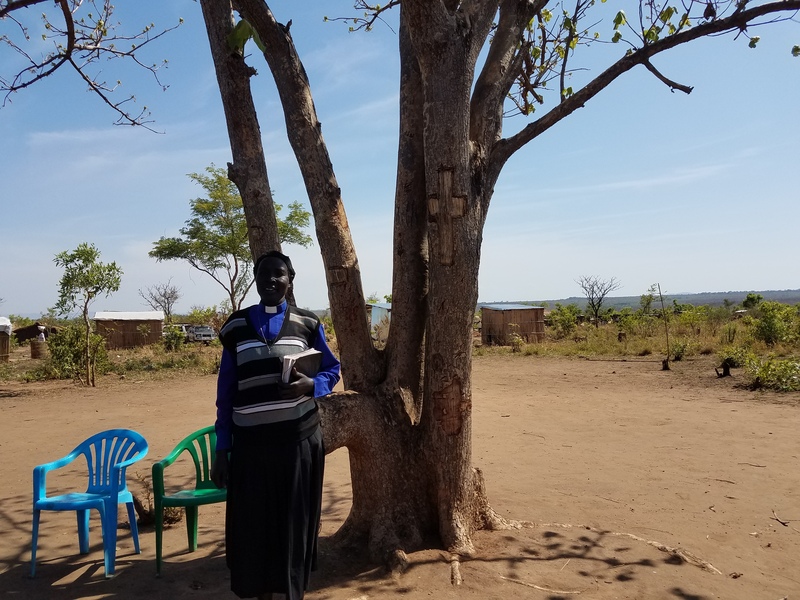 Each person introduced themselves and one man started by saying, “We praise God every morning”…meaning that although life is very difficult for them, they are thankful for the safety and provision they have found in Northern Uganda. Everything comes from the Lord and we can only give back to Him what has already come from His hand…except for a sacrifice of praise, which is ours alone to give. I imagine praising God every morning in the midst of such suffering is indeed a great sacrifice, one that these Sudanese Christians make with no hesitation. 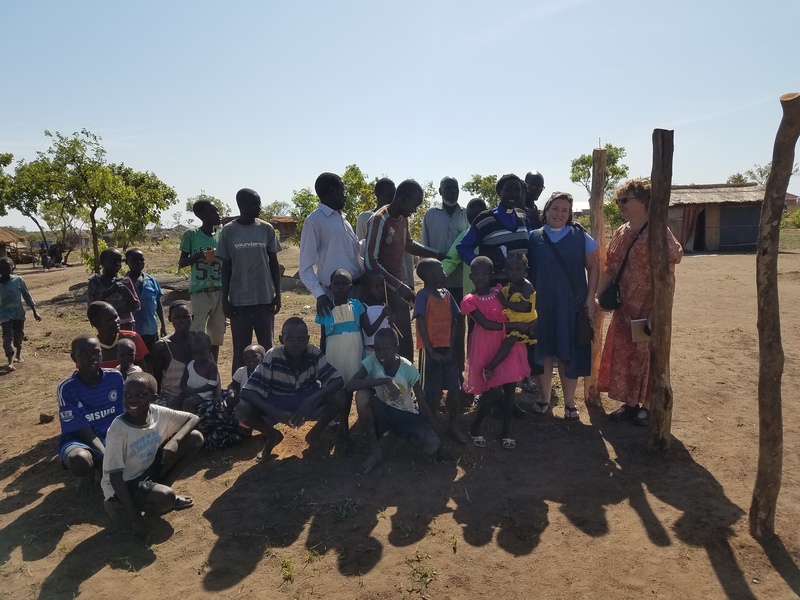 Dr. Katie Rhoads, an American missionary with whom I share a compound in Gulu, has been ministering to the South Sudanese refugees for several years. She makes the two-hour drive to Adjumani quite regularly so I asked if I could tag along. I’ve had refugees on my heart for a couple of months. Well, little did I know…I was an answer to prayer. Although food is scarce, these refugees are not starving, like many thousands of others who have been unable to flee South Sudan as the war there continues. The UN and other NGO’s are doing their best to provide food, health care and very basic needs. The Ugandan Govt. has given each family a small plot of land…about the size of an average yard in the US, to live and maybe grow a few vegetables. They are given some building materials and it is up to them to construct their own mud huts. Some schools are also being built for the children. The first church site we visited…they have put up poles and a few home-made benches to sit on. Without a roof…it is too hot and soon the rains will comes. 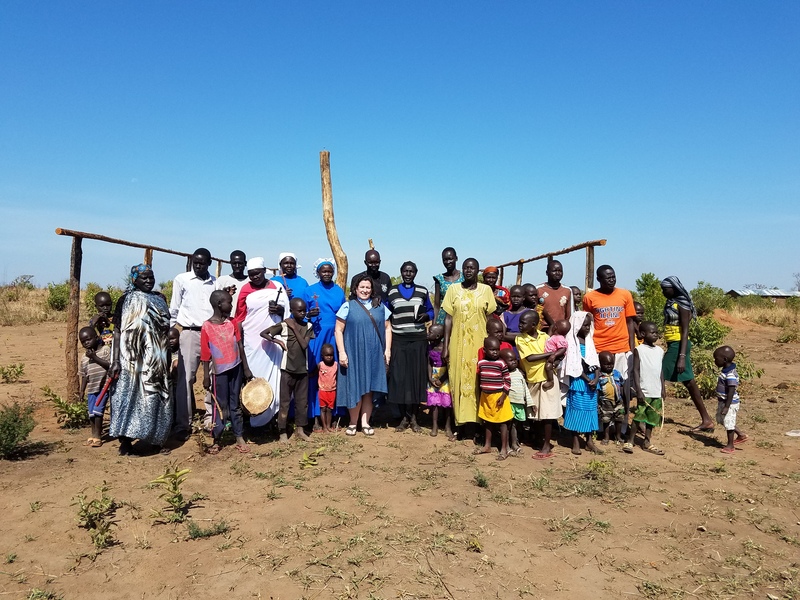 To my surprise, they did not ask for food or clothing and other items they obviously needed…But what this group of Anglican believers have been praying for is the resources to build some kind of shelter where they can gather to worship and hear God’s word and be encouraged. They are struggling daily to carve out a life for themselves in the settlement and yet what is utmost in their minds is that THEY WANT TO GATHER TO GIVE THANKS TO GOD AND READ HIS WORD AND BE ENCOURAGED! They have started to build two different simple church structures. You can see in the photos that they have marked off the footprint of the shelters with poles…but that is as far as they have been able to go. The UN does not give materials to build churches. They need more poles, bamboo, nails and grass to make a grass thatched roof…all of which costs money. So…they prayed that the Lord would send someone. He sent me…and now I am appealing to you, my fellow Christians. The group from Site I – Dr. Katie is on the far right. Site II – Only the poles for the walls are up. Would you prayerfully consider making a contribution to help these brothers and sisters in Christ to have a place to worship the Lord and find encouragement by being together? To those in the Diocese of South Carolina, perhaps your parish has been praying and asking the Lord to shine a light on a need that you can meet. Here is an opportunity for you to participate in building up and encouraging fellow Anglican believers who are struggling and suffering and fighting for survival after being forced to flee the bloodshed and starvation in their home country. God willing, my prayer is to raise at least $ 1,000 which will cover building materials plus some Bibles as well. If the Lord provides more, it will all go to providing resources for worship in the camp…things like communion elements, altar and linens, etc. There are about 3,000 Anglicans in this particular settlement alone. They want to be fed spiritually…the Lord is asking you to participate. Will you help? Rev. Rachel stands under the tree which marks the current worship site for Group II. Look closely and notice the cross carved into the tree to mark the sacred place of worship. A selfie with Rev. Rachel. 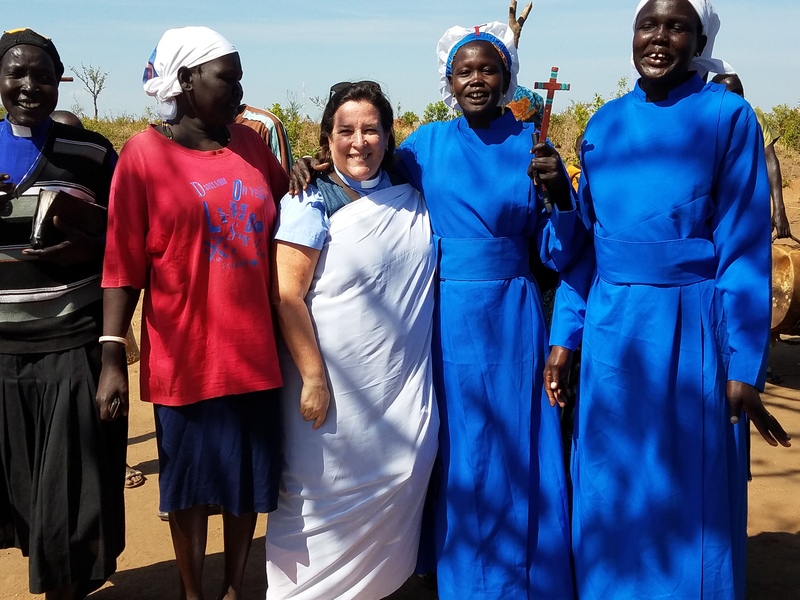 She only speaks Dinka so we could not communicate directly without a translator…but we really didn’t need to…we share the same Spirit! The woman to the left of me presented me with the sarong-type clothing. It was part of her uniform as a member of a women’s prayer group called Thiec Nyalic which loosely translates as “Ask God Anything” Prayer Army! I think I am now an honorary member and I am asking God to soften your hearts towards these determined Christians. As we were sitting in the hut talking, I asked if they were all from the same village in South Sudan…if they had known each other before and had come to the refugee camp together. “No” they said…”we have only met since arriving at the camp. We come from different places and even different tribes. We found each other after arriving.” Then Rev. Rachel spoke up and said that they are all one in Christ and she quoted Psalm 133 “How good and pleasant it is when brothers and sisters live together in unity.” They have found each other and are stronger together. Praise God for the unity we have through our Lord Jesus Christ! Thank you for taking the time to read this blog. Please pass it along to anyone you feel may want to help these dear brothers and sisters in Christ. May God bless you immensely!